The History Blog » Blog Archive » Can you decipher the inscription on this sword? 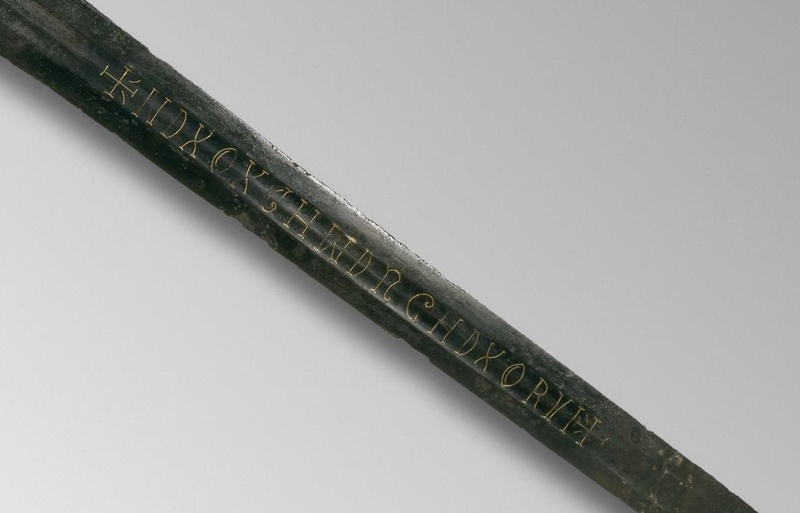 Can you decipher the inscription on this sword? Experts haven’t been able to decipher this mysterious assortment of letters, so the British Library’s phenomenal Medieval Manuscripts blog is opening up the floor to the Internet. Some think it was a religious dedication of some kind using the first initials of words. There are inscribed crosses on the other side and an inlaid crescent near the point on both sides which may be the maker’s mark. The sword was discovered in the River Witham, Lincolnshire, in July of 1825 by workers widening and deepening the river just below the lock to make room for larger vessels. The Bishop of Lincoln gave the sword to the Royal Archaeological Institute which in 1858 donated it to the British Museum. It dates to around 1250-1330 and has a straight cross guard with a wheel-shaped pommel atop the grip. Weighing 2 lb 10 oz and measuring 38 inches long, the sword was a killer, capable of cleaving a man’s skull in two. 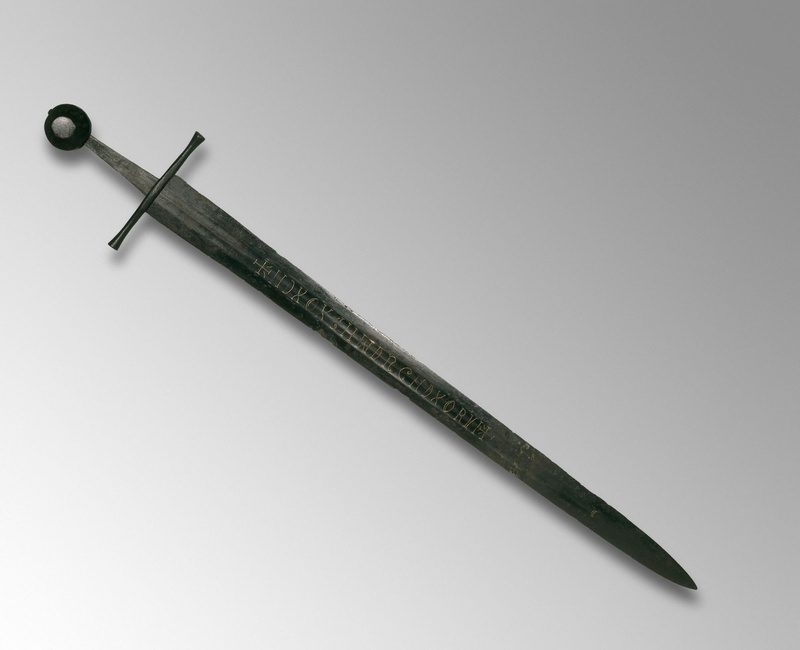 This kind of sword was a classic knightly weapon of the 13th century and is depicted in many an effigy and illustration. 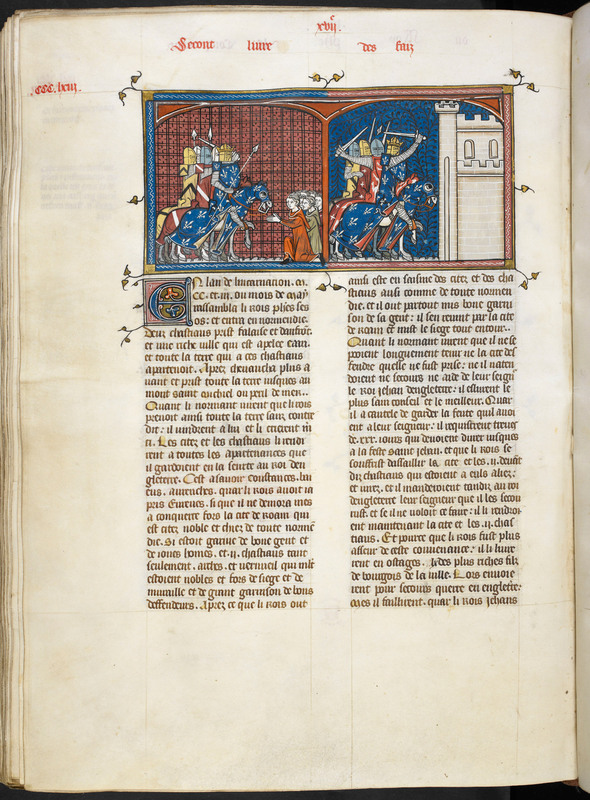 Here’s an example from the British Library’s 14th century illuminated manuscript of the Grandes Chroniques de France in which French knights besiege Rouen in 1203/1204 during King Philip Augustus’ invasion of Normandy. In fact, the sword was believed to have a very close connection to French knights from that turbulent period. When the sword was first discovered, workers found other armature — swords, daggers, chain mail — in the muck of the riverbed leading to speculation that these were the remains of French knights who had drowned in the river after the Second Battle of Lincoln in 1217. When the First Barons’ War broke out between King John and his nobles in 1215 after John refused to abide by the terms of Magna Carta, the barons invited Prince Louis of France to take the throne of England. He accepted and turned up with an army in May of 1216. Louis waltzed into London unopposed and was proclaimed king in a ceremony at St. Paul’s Cathedral. He doesn’t make the official king list because he was never crowned, but for a while in 1216-1217 the Dauphin of France actively occupied half of England. The tide turned when King John died in October of 1216. Even though John’s son Henry was only nine years old, barons who had sided with Louis switched sides in droves. William Marshal, “the greatest knight that ever lived,” was Henry’s regent and fought at the head of his army, drawing more knights to abandon Louis for Henry. On May 20th, 1217, forces loyal to the nine-year-old King Henry III of England attacked the city of Lincoln, then held by the French. The English held Lincoln Castle, however, so while Marshall’s army took the north gate of the city, Falkes de Breauté deployed his crack crossbowmen along the castle ramparts to rain a hellfire of bolts into the French occupiers. It was a rout, followed by a very thorough pillaging of the city that has gone down in history as the Lincoln Fair. 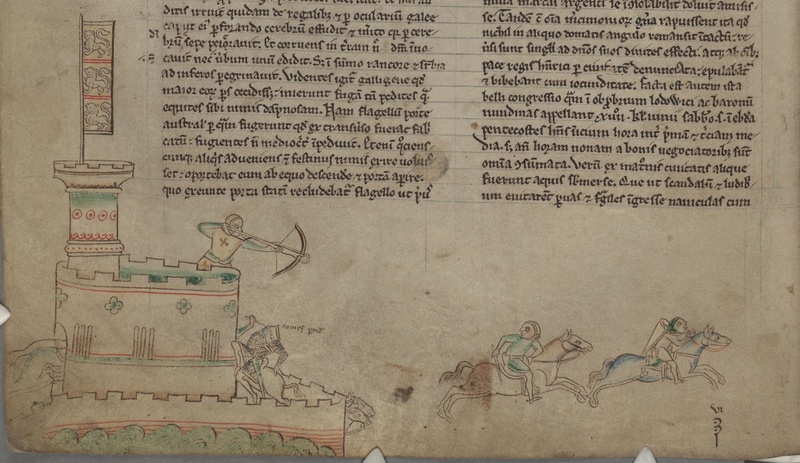 French knights who weren’t killed or captured fled, some of them sailing down the Witham. Some of the ships, laden with men, arms and armour, sank drowning the flower of French chivalry and, ostensibly, leaving their stuff behind for canal diggers to find 600 years later. Without identifying marks connected to specific knights, this story is impossible to prove. Still, the design and period of the sword make it relevant as a weapon very much like those used during the battles between the English crown and its unruly barons. It’s neat to think that it may even go a step further and be an actually relict of the First Barons’ War. If you have any ideas about what the inscription might mean, join the party in the comments on the Medieval Manuscripts blog entry where smart people are saying smart things. This entry was posted on Wednesday, August 5th, 2015 at 2:31 PM	and is filed under Medieval, Museums. You can follow any responses to this entry through the RSS 2.0 feed. You can skip to the end and leave a response. Pinging is currently not allowed. I immediately thought of Ulberht swords. I’m neither a Viking scholar nor a medievalist, though. Maybe the inscription was added after it was found? Since it seems that someone has added crusader symbols and fake latin, and a tiny half moon at the tip. It somewhat resembles roman numbers, though everything is wrong and makes no sense. At the same time the golden engraving is to well preserved, this blade does not seem to have been wielded since it was decorated. Perhaps a souvenir of sort to commemorate a travel/part of the crusade to the holy land? … ok, that was REALLY cryptic. with the ‘X’s as word separators: “By Our Lord, this Sword belongs to Orvi”. I think it’s interesting that it weighs less than 3 pounds. Oh, but medieval swords were soooo HEAVY! Like, barely liftable by ordinary people! At the beginning could ND be Nomine Deum, for the rest of it try either the canon of the Mass or relevant prayer or invocation of the period. Following up on this suggestion, could the “X” indicate the Greek initial (Chi) for “Christ”. might then the beginning be “Nostre Domine Christus” – “Our Lord Christ…”? Mabey dates in Roman nurmerals and inetials? cross-shaped signs, made before, and behind an inscription on sword 1 indicate that the inscription is complete. The inscription is probably made in Roman majuscule, and is probably Latin. +NDXOXCHWDRGHDXORVI+: ND = N(omine) D(omini), (X)ristus ?, C or CH = C(hristi)?. You get the idea. Some swords had abbreviated psalms. Google sword inscriptions and further assistance. It is to bad that this excellent blog draws attention from so manny naive persons.Yes, I’m from Europe. the middle section ie CHWDRGHD has a hint of welsh about it, but no partic word comes to mind. if the Xs are spaces between words then ORVI could be a name. but if this item was left in 13th Cent. lincs, then there wouldnt’ve been much of a celtic presence there by then. I know what you mean. I’m thinking the sword was created 1200s but inscribed 1400s for King Henry VI. Encrypted because he was on a special mission. It was the time of the war of the roses. So maybe they were agents of the King sent North with a message. Maybe they were on a spying mission. But I also think their may have been an Emperor in the 12CE. I will check him out. The Crusader symbolic crosses could have been an invocation of the spirit of the people who won France for England when the sword was made. So, the sword’s inscription reads: “By God, my chowder’s the goodest (best) in the world” … or something like that. I vision the first and last symbols as Templar crosses and the marks notating the “beginning and the end” If you notice them they face opposite could this mean that the rule of the church is over and that the rule by the people has begun? to Catherine, an intriguing idea. the year 1400 jumps out so could we amend your theory slightly and place it during the Glyndwr [Glendower] rebellion? either a message to, or from him? possibly heading to or from the coast to France? i wish we had pics of  the reverse side of the sword and  the other items recovered at the same time. context very important in arcy as we know. to find out the history of the item, solve the riddle! Then we split CHWDRGHD in three seperate pieces. All words are translated from Welsh to German and then into English. ORVI is ORUI which can’t be translated directly from Latin into Welsh. As we know it is WAIT I translated wait into Welsh AROS. I truly believe that the transcription is wrong. Just take look at this study: http://www.gustavianum.uu.se/digitalAssets/203/203037_3medieval-christian-invocation-inscriptions-on-sword-blades.pdf . According to picture 29 the 10th letter is not a “R”, but a “N”. And the 11th letter is more likely to be a “C” and not a “G”. More confusing is the “W” though, since there is no “W” in Latin. The used stamp seems to be a “M”, which is just used upside down. Maybe the blacksmith was a bit illitarate? Or he was in a hurry and just made a simple mistake? Or it really is a “W”.In that case it could be a German or Dutch Name. Even heathen god Wodan (WDN) aka Odin is possible. but if the X are repr of spaces, why would the central section need redividing? this might mean the X are letters after all. now, we agree this bit LOOKS welsh, and could just plausibly be. but most likely a single word, and still cant think of one. I bet it was made by someone who couldn’t read, therefore spell, and they wanted lettering on it like everyone else. You may need to sound it out and “hear” what it says instead of read it. I’ve stumbled across this puzzle this morning and have done some very quick research. I was wondering if it is in fact rustic secretary (black letters) used in Roman times and also in Mediaeval writings. I’ve been looking at the image of the letters, and wondered if the two images at each end of the letters aren’t in fact letters themselves. The letter K at the beginning and the letter H at the end. With them having the horizontal line through them I wondered if there was some significance to these letters. Unfortunately, I only had a few minutes to look in to this, but I find it intriguing, and will look in to it some more later.